In the popular imagination, Nepal is a land of eternal snow, where heroic mountaineers and Sherpas valiantly plant flags on the roof of the world, or perish in the attempt. And yet there is far more to Nepal than the ultimate challenge to mountaineers. It has to be one of the most diverse countries in the world, for its climate, scenery, flora, fauna, and not least on account of the complex variety of its cultural, ethnic, and religious weave. Never a colony, Nepal was isolated from the rest of the world for centuries. Its extreme terrain has both protected it from outside influence and slowed its development. Its relative inaccessibility has allowed pockets of contrasting cultures to flourish. At the same time, these have largely coexisted in peace, thanks to a tolerance, openness, and mutual respect that prevail by and large to this day. Culture Smart! 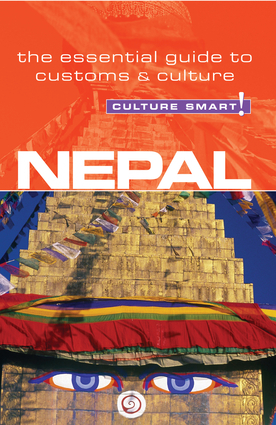 Nepal introduces you to the cultural, ethnic, and religious mosaic that is Nepal. It seeks to explain the complexities of all aspects of Nepalese life, from the home, to the marketplace, to the office. It describes how the country’s geography and history have helped shape contemporary society, and how religion defines social structures and leaves its indelible imprint on the Nepalese mentality. It helps you to understand Nepalese attitudes and values, giving you an idea of what to expect, and how to avoid faux pas. You are unlikely to meet an unfriendly face in Nepal. It may be one of the ten poorest countries in the world, but you will always be made welcome. Whatever the reason for your visit, understanding the cultural backdrop will help you get beyond the friendly smiles and greetings, making it an extremely enlightening and rewarding experience. Namaste! To greet and to say good-bye in Nepal you put the palms of your hands together in front of your chest, as if praying, and say Namaste. This literally means “I salute the godly in you.” Raising the height of your hands shows increasing respect.